Update: Shortly afer this article was published, the developer contacted me to provide the following statement. I am willing to take them at their word for now, and once a further Kickstarter update is published I will be putting togethera follow-up article. However I would like to make it clear that the developer was originally contacted for a statement in early November, and that the article was published once over three weeks had elapsed with no response. It’s now almost a year since the last update was posted for Super Roman Conquest, so it’s safe to assume the game is dead in the water. Examples of crowdfunding video game projects failing their backers are (sadly) all too common. So what makes this one stand out? Well for a start, there were no warning signs. Usually there are long periods of silence during development, with no clear signs of progress. Often this is accompanied by tales of woe such as a severe illness or the creator becoming unemployed. But that’s certainly not the case with Super Roman Conquest. 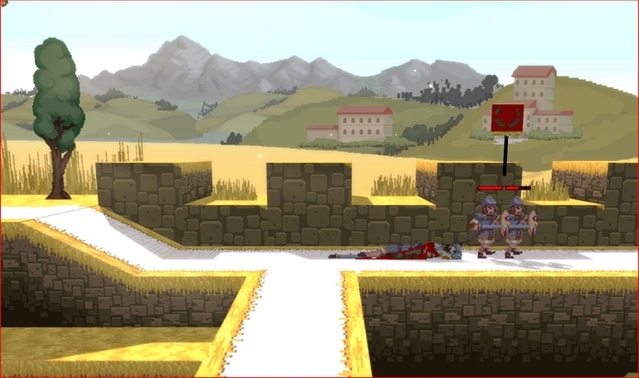 Since being successfully funded on Kickstarter in November 2013 the side-scrolling strategy game seemed to have been progressing extremely well. Developers SeaCliff Interactive were posting comprehensive updates every few months showing off images and gameplay clips. A demo was released, plus an alpha build while the developers were present at several game festivals. 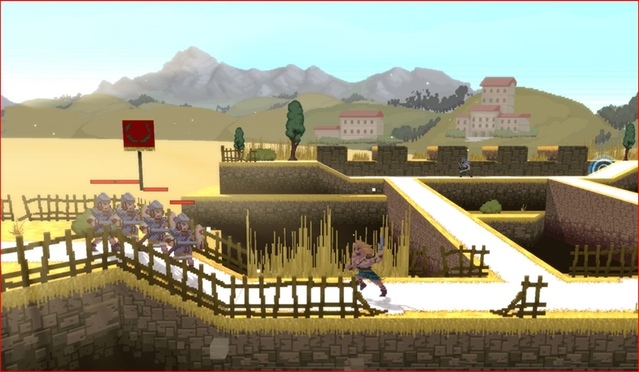 Super Roman Conquest was Greenlit on Steam and in January 2016 an announcement was made that the Steam build was expected “within the next couple of weeks”. And then… nothing. The shutdown in communications when the game seemed so close to release seems to have completely caught the backers by surprise. At the moment their shock and disappointment seem to be outweighing any anger, as backers continue to post on the Kickstarter page asking for any news. But seeing as the developers have also abandoned the Super Roman Conquest Twitter, Steam and Facebook feeds it’s clear they have no intention of ever responding to their backers. Even the domain for the official website is now up for sale, in case there was any doubt. Given the situation I wasn’t expecting a response when I contacted SeaCliff Interactive for a statement – and I didn’t get one. However I was half-worried that something serious may have happened to the two-man development team. Industry veterans Matt Boland and Tim Temmerman didn’t seem the type to simply disappear without any explanation. Plus given their day jobs at major developers they would presumably know how to be professional and not want to attract negative attention. So I dug a little deeper. Matt Boland’s personal Twitter account has also been inactive for more than two years which wasn’t reassuring. Both their Facebook profiles are set to private which didn’t help. However I then discovered an online interview with Tim Temmerman in July 2016 related to his work on Halo. Following this I checked the Facebook profiles of their friends and family (who weren’t set to private) through which I could see they are both alive and well. This low-level cyberstalking was making me feel a bit uncomfortable, but I continued by looking up their LinkedIn profiles. Interestingly Tim has no record of Super Roman Conquest on his page. However Matt proudly displays his role as Co-Founder of SeaCliff Interactive – along with details of the Kickstarter. Both still seemed to employed by major studios (343 Industries and TellTale Games), and it seemed likely to me at this stage that their day jobs were likely the reason they had given up on supporting the Kickstarter. To be fair, they hadn’t hidden the fact they had day jobs. They’d actually announced they had these new jobs in a June 2015 update to backers. At this time they also reassured backers they were continuing to work on Super Roman Conquest, and that all funds raised had gone towards development. They asked backers to trust them – which they continued to do. However, their LinkedIn profiles show that Matt Boland actually started at TellTalle in February 2015. Meanwhile Tim Temmerman started with 343 Industries way back in September 2014. I can’t help but find the time taken to reveal this information a bit suspicious. – Matt Boland, January 2016. And this is where I began to get angry. Matt Boland and Tim Temmerman had slowly begun to phase out the various points of contact for some time before they disappeared from Kickstarter. They stopped updating the official website in 2013, the last Facebook announcement was in January 2015, the last Tweet was in September 2015 and they were last seen on Steam in January 2016. And of course they made their personal Facebook profiles private in late 2014. From all this I was drawing only one conclusion. They were quietly getting ready to give up, while still posting on Kickstarter and pretending to their backers that everything was progressing perfectly. To me this is far worse than a developer who gets in over their head. This was actively deceiving backers, and even getting their hopes up with the promise of an imminent release. Following the June 2015 update about their new jobs there were further updates in August 2015, October 2015 and January 2016. Clearly they had no intention of offering any sort of refund to backers. But with Kickstarters most backers appreciate there is an element of risk when they pledge. What is more cowardly is not offering any sort of apology to backers, or even explaining the situation. There might be some anger if they just admitted their new jobs meant they couldn’t continue development, but at least then backers would know what had happened. There are still many unanswered questions about Super Roman Conquest. What has happened to any remaining funds? At what point exactly did the developers know they’d be abandoning the project? Was the whole Kickstarter in fact an elaborate effort to attract the attention of major studios and gain full-time employment? We may never the answers, but the enforced silence from SeaCliff Interactive certainly shows they have no respect for their backers.